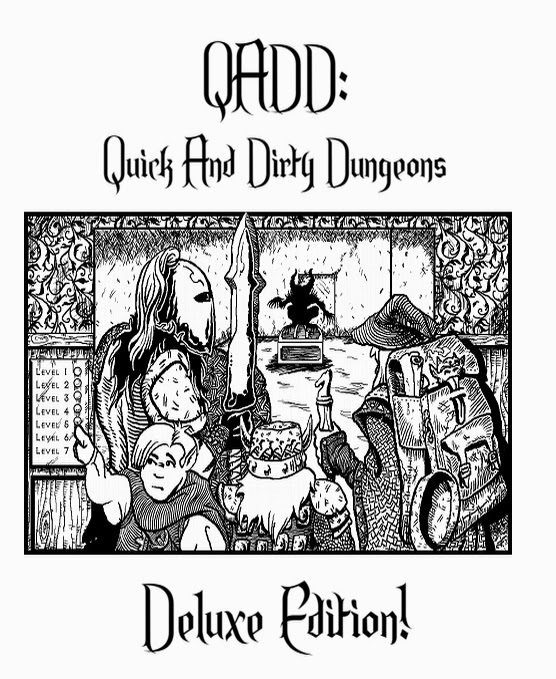 Charlie Fleming was kind enough to send me a review copy (PDF) of his game Quick and Dirty Dungeons (QADD), an excellent rules lite game that looked like a nice combination of Tunnels & Trolls and Dungeons & Dragons – though note that comes from somebody who is only slightly acquainted with T&T. The game is 79 pages long and covers character creation, equipment, play rules, magic, monsters, along with including two adventures – one solo and one designed for play with a Game Master – and appendices A through Z consisting of all sorts of useful tables. The layout of the game is clean and easy to read, and the art is old school black and white … just like I like it. The writing has a fun style and is clear and easy to understand. The game presents humans, elves, dwarves and halfkins, and warriors, wizards, clerics, rangers, druids and rogues – plenty of options for players. I think QADD is an excellent choice for pick-up games or full campaigns where you want to spend more time playing than consulting rules. I think it would also lend itself to novices learning how to play rpg’s, again due to the rules lite nature of the game and the fact that the classes have simple, straight forward special abilities – not much that requires explanation or memorization. If you’re looking for a game that gets things done, I wholeheartedly recommend QADD. Click HERE to check it out. How does this game handle using any type of die? (I only got that from going to the linked page, you didn't mention this). In any contest, each side rolls a number of dice, with each side trying to roll the highest number. Obviously, the type of dice used does have some effect – 2d4 vs. 3d4 is different from 2d20 vs 3d20 – so the gamers will have to take that into account when they decide what type of dice to use.